Anyone who has spend any amount of time with me will quickly learn that I am the “Angel of Death” when it comes to trees. I’m not talking about trying to grow them and not having the “green thumb” so to speak. More like if the tree don’t fit into my master plan it is cut down and thrown into the lake of fire. You may laugh but this is very true. 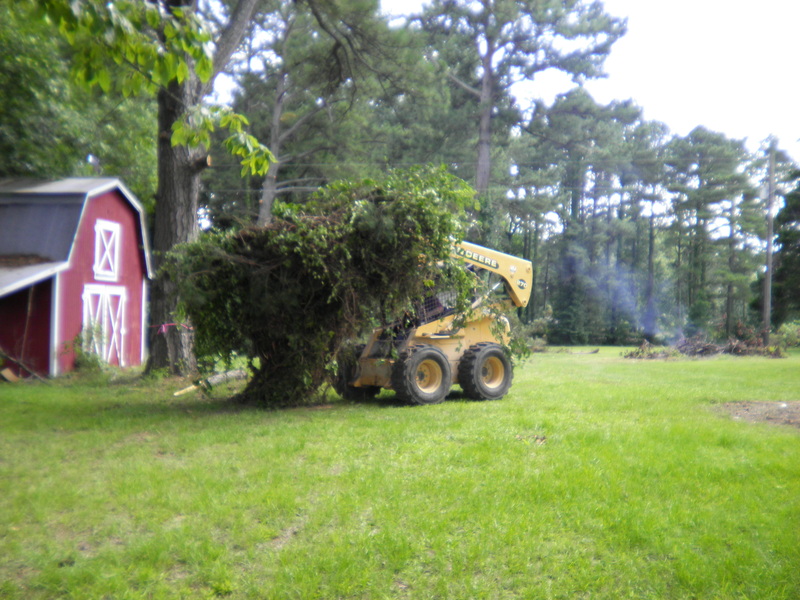 When we moved to our property 3 years ago I was determined to have every pine and sweet gum tree cut. Over 120 trees lost their lives in my path of destruction but the end result was a masterpiece. Trees mean a lot more than just to provide shade and homes for the birds. Often times they are referred to in the bible as people. Just a few weeks ago I published a story “Different, but yet the same” that spoke about pine trees and how they can be compared to the Christian life. Their lives can tell the story of the death, burial, and resurrection of the life of Christ. Or you may be thinking how it tells the stages of our lives thru spring, summer, fall, and winter. It is the great circle of life and the very intelligence hidden within them comes from God. Trees are fascinating creations that appear to be hands springing forth from Earth reaching up to the heaven to praise God. Now in this mindset let’s look deeper at how my destruction can give you perhaps a deeper revelation. As any young couple with their first new place would be, we were excited to get started on the projects and making the place our own. Looking back now if this old place didn’t hold sentimental value from a dear friend who passed we would have never considered buying it and taking on the renovations it needed. It was so overgrown in pines and gum trees, prickly thorns, and the poison ivy was just unreal. Since we were not able to see our neighbor’s house we thought, “hey, let’s go down and meet them.” We knocked on the door and after a brief introduction the first thing she asked was “Are you going to cut those trees?” We had the best laugh. Bless her heart, they had lived there for years dealing with the mess of the pines shedding and doing damage to their driveway. We can so easily identify with them as Christians who are praying for the hope of redemption from being heavily burdened by sin of the world. The thorns and the Poison Ivy represents all the adultery, fornication, uncleanness, lasciviousness, Idolatry, witchcraft, hatred, variance, emulations, wrath, strife, seditions, heresies, envyings, murders, drunkenness, and revellings of what we as Christians have to deal with. It was a relief for us all to get rid of these burdens. So our journey continues as we walked out into our field and marked each tree that was to be saved. Then we sent our workers out into the fields and told them to cut down every tree that was not marked with that red tag nor save any tree that other tree that would not bare good fruit. 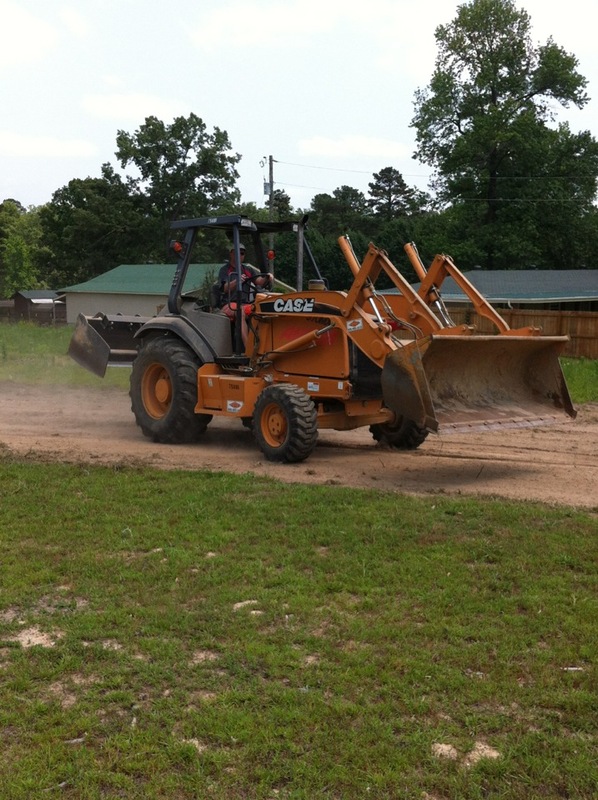 We had them push the rubble into big piles to be burned. Then all the stumps were to be ground up and remembered no more. It was like the Angel of Death moved across and judgment fell upon the land. This just reminds me of how God will do in the same in his great judgment for those who are not covered with the blood of the lamb and who bare his holy spirit. All of those poor trees lost their lives but one pine still stood. Now why do you think that I choose that one out of all of them to keep? It’s actually interesting but that tree was originally on the list to be cut. At the very end when it became its turn, something caught my eye and I took a liking to it. Now that tree stands strong and is a beautiful reminder of the “thief on the cross” and how he found favor with the Lord at the end of his life. So now that the dust has settled and I look out across the land. 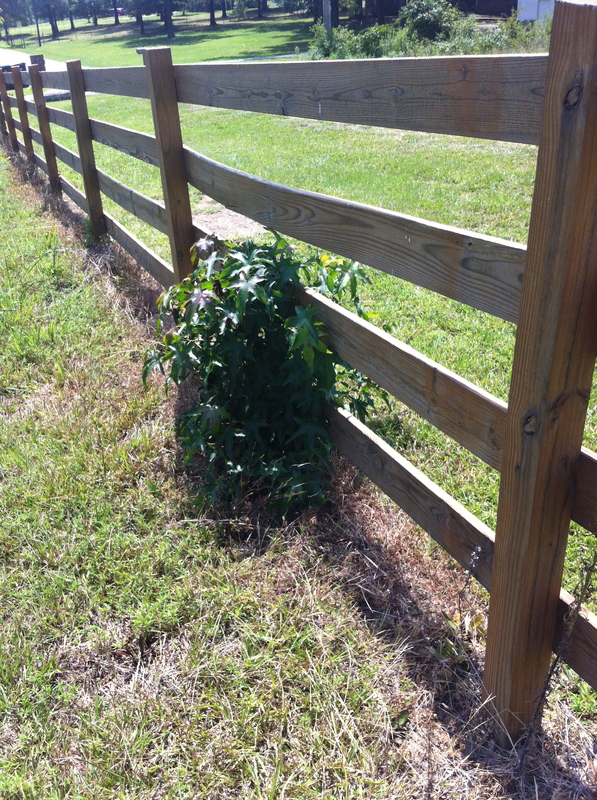 I notice this little gum tree trying to grow up in the fence line. He’s growing up on both sides and thinks he is safe!!! That is annoying and of course he has got to go, but what can we learn from him. How many Christians do you know that think they can have one foot in the world with their drinking parties and adulterous relationships and then have one foot in the kingdom and come to church on Sunday? They join that church or organization thinking that will cover them enough to be safe. No!!! Hypocrite!!! Just remember the Lords words in Matthew 7:23 will echo in their ears, “Then I will tell them plainly, ‘I never knew you. Away from me, you evildoers!” Well, in a way you can’t fault the little guy for trying because it sounded like a good idea at the time, but in the end he was cut down. 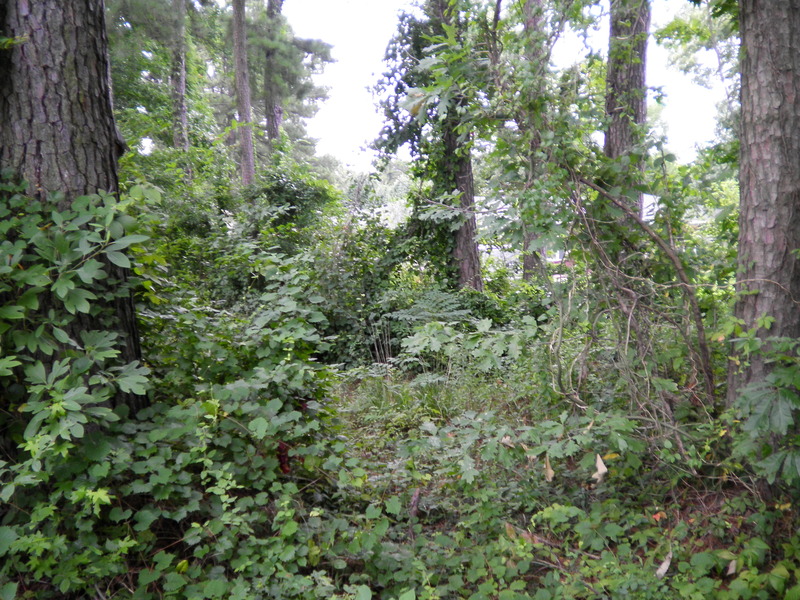 Now we have to move and were unable to finish up the remaining cleanup of the trees in the front yard. There are many oaks planted in the mist of the pine and gum trees. Even though it is a small remnant we plan is to save them but they will have to go through the destruction when we return in four years. Think of these trees remaining as the Great Tribulation Saints. They will be saved but look at the destruction that will be all around them that they have to witness and endure when the Lord returns. What about the dead trees on the outer perimeter that belong to the county that are peering over in to my land? These trees can be thought of as the souls that are in prison who never belonged to the master in the first place who are crying out across that great gulf and can never enter in. It is just fun to take the life of a tree, study it, and apply it to the Christian life. You may never look at them the same again. Each has it’s own purpose and can tell the great story. I think of the little persimmon tree; had it been given more light (which is revelation) it would have grown twice its size. Or I think of the old pecan tree that had fed so many through the years (which is the seasoned pastor). One tree planted here is a cedar that someone took a chain and wrapped around and forgot about removing it later. 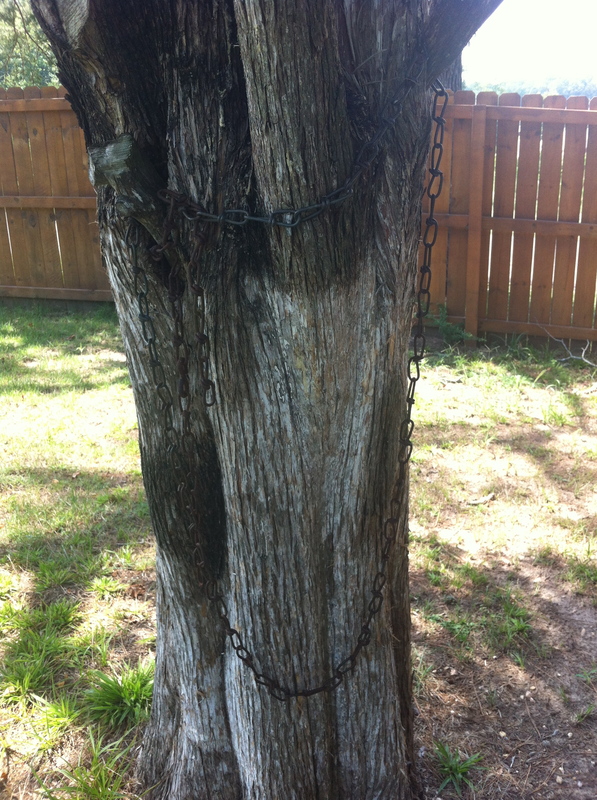 The chain grew so deep into the tree and bark that it nearly died. Doesn’t that remind of you someone who has heard a wrong teaching and then battled the chains of legalism to the point it has choked them out from growing to their fullest? Even the tiny sapling can represent the new believer. But the greatest of all is the 200 year-old Red Oak can reminds us of our grandparents who have left each generation with their legacy. Even when a tree sheds its dead limbs (sin) it will reproduce a new one in its’ place (this is the new nature). I hope you will have fun with looking at trees in a different likeness. Think about its purpose and how it applies to your own life. I realize we each have our own faith. Many lose fellowship because of our differences. My goal is not to get you to believe the way that I do but only to perhaps spark an interest in getting to know the Lord more. I can’t answer for you nor can you answer for me. And none of us can go hanging on the back of our mothers’ skirt. It is an individual decision and my hope is you become deeply rooted and can place your identity in him. Can you see the parallel of the masterpiece?